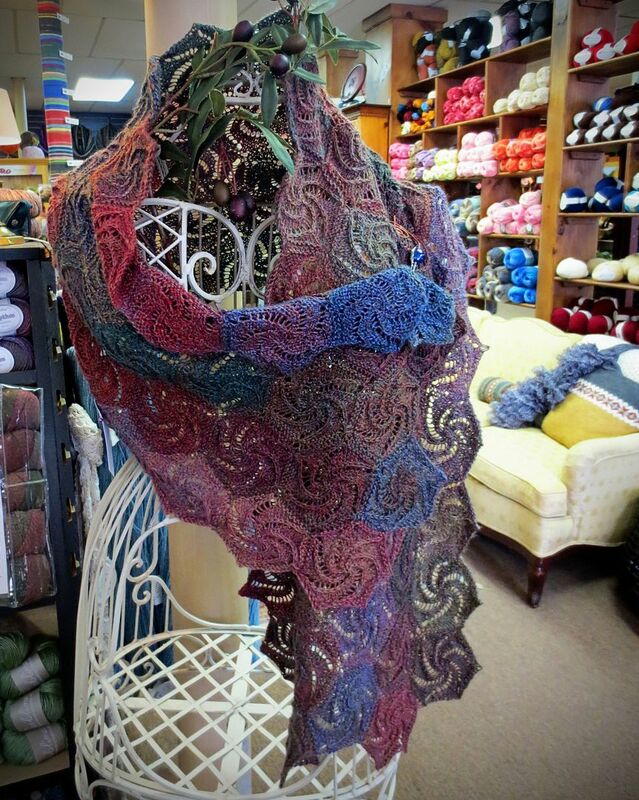 I recently finished a sample knit for my local yarn shop-- the Jojoland Melody Swirl Shawl. 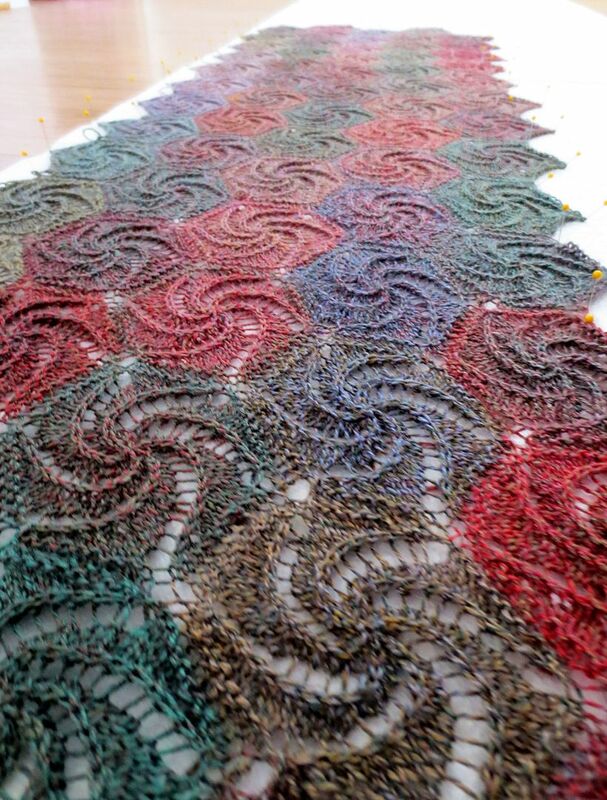 It's made up of 82 hexagons with a swirling lace pattern. I used the magic loop method on my size 6 Knitpicks Harmony Options needles. When I started, each hexagon took about an hour to make, but by the last two rows of hexagones, I had it down to 40 minutes or so. And since each hexagon is knitted onto the ones before, there's no seaming, and there's no epic bind-off at the end! Yay! Here it is on display. It was so exciting to see my knitting among the other gorgeous samples! 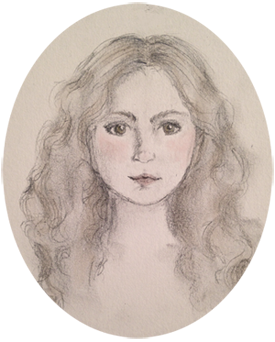 For more technical notes, check my Ravelry project page. Woohoo! There is nothing like the satisfaction of completing a big project. That is gorgeous! Well done, that's some seriously impressive knitting going on there. Your LYS looks lovely too, I haven't managed to find one close to me that is that cosy. Aw, thank you so much! I was really excited with how it blocked out. :) And I did get very, very lucky in the LYS department, for sure. Thank you so much! It's true, it has been all hexagons, all the time around here lately! Aw, I'm sorry to hear that German yarn shops are a bit less cozy... Your projects certainly aren't suffering, though, they're all gorgeous! What a gorge scarf - you're so talented! Aw, thank you Miss Lisa! That's so sweet of you! 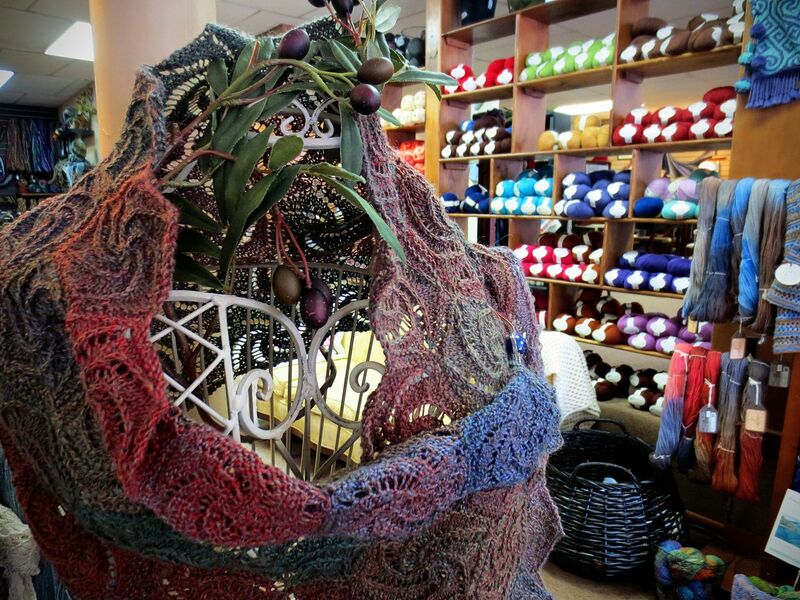 I am in total awe of this shawl, it is absolutely beautiful! You are lucky to have a LYS nearby! The closest one we have is about 40 minutes away. Ohhhh goshhhh, thank you so much! I am so lucky, my LYS has an amazing array of yarns and a wonderful group of ladies to knit with. It's even become the LYS for people who live much closer to other yarn shops just because it's so welcoming and has such a great selection!